Roberto Vila has been working for Mastercard for the past four years. He is currently in charge of Digital Communications and Content Development for Latin America and The Caribbean designing and leading plans to transfor the external communications aproach all over the region. Previously Roberto used to manage Communications for the GeoNorth division (Mexico and Central America). 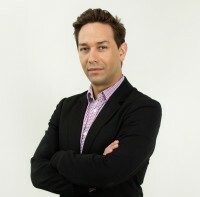 He previously worked in the financial industry and in the Travel & Entertainment and Life & Style business. He has a Bachelor’s degree in Communications focused in radio and journalism and a Master’s degree in Digital Marketing.